It's with a mixture of pain and pleasure that I announce the retirement of my Afrobat comics numbers 1 and 2. They sold reasonably well, and I initially designed them in the mode of 1970s Underground Comix, very much in the vein of Grass Green's work. You could probably add in some elements from Blaxploitation films and a little Kirby storytelling and you'd more or less have it. 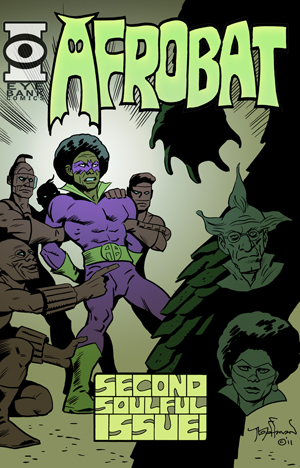 What happened there was typical of any fan's search for graphic fulfillment, but in this case a Black man's eyes scavenged the table-tops and locked onto the African-Afro of my Afrobat comics. He had his two young sons with him, and bought both issues. At the time I pocketed the cash and thought little of it, but later I admit some shame that he likely expected a real superhero and instead got ridicule of his race. I am not happy at the prospect of kicking people when they are down, and to African-Americans, that's partly what Afrobat does. 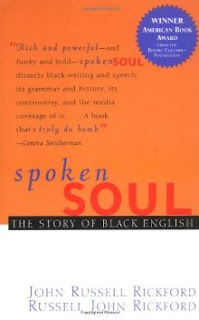 Had I made clever wordplay that parodied White language, like "collateral damage" etc., the pain wouldn't be as great as when inflicted on a people so downtrodden and victimized for so long. Even now when Whitey gets uptight, they seek out the same old Whipping Boy, perhaps now in the useful form of "Welfare Queens", and get straight to work. So, my own aptitude with language, grammar and dialects directs my mind to create wordplays like "Himalayan over there", which might be funnier if they were directed at the wealthy and powerful instead of African-Americans who suffer at the bottom of society. The salient point here is that Ebonics "jokes" basically say that these people are too stupid to speak "properly". So, my feelings of guilt and shame over this are expressed in the retraction of Afrobat. Maybe he'll be back someday in another form, more kind, compassionate and loving.